The Embassy of France in Nigeria and Campus France, is committed to increasing Nigerian students’ mobility to France. French Embassy, has a double mission: to promote French language and francophone cultures, to relay information on franco-nigerian cooperation. The Embassy’s main aim is to give future France alumni the keys to becoming a complete success story in France and everywhere. The French embassy is one of 166 foreign representations in Nigeria, and one of 106 foreign representations in Abuja. 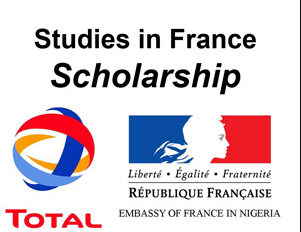 TOTAL E&P Nigeria Limited in partnership with the French Embassy in Nigeria is inviting applications for TOTAL/Quay d’Orsay Scholarship. This scholarship is intended for outstanding Nigerian students to pursue master’s programme in France. Applicants of Nigeria can apply for the scholarship. Applicants must hold a first degree with atleast Second class upper division. Interested applicants should send their complete application to nigeria@campusfrance.org in a single PDF file saved as Name_Surname_Total_French_Embassy_Scholarship_2017.